Clinton Kelly made two great recipes on The Chew. His Spaghetti Squash with Roasted Red Peppers recipe was meant to be a light, healthy dish you can have during the week. But when it comes to the weekend, Clinton Kelly made a sinfully great savory dish, his Cheesy Squash Fondue recipe. Whichever you choose, you should know that both looked absolutely amazing and you pretty much can’t go wrong with either! Check it out below! Brush the flesh side of the squash with olive oil and season with salt and pepper. Then place them flesh side down on a parchment paper-lined sheet tray. Roast for 45 minutes until fork tender. Once cool enough to handle, scrape the spaghetti squash out of the skin and discard the skin. Saute garlic in a large saute pan in a drizzle of olive oil over medium high heat for 2 minutes, until fragrant. Clinton Kelly said this is to get the raw flavor of the garlic out of it, rather than to brown it. Remove from heat and add parsley, spaghetti squash. and roasted peppers. Toss to combine, add salt and pepper to taste, and serve. This recipe is only 32 calories per serving, so enjoy! Daphne Oz said this was a great recipe to try any day of the week, because it’s so easy, delicious, and nutritious. I can’t argue with her. It looked amazing! Cut a small piece off the bottom of the squash so they lay flat and add them flesh-side up on a parchment paper-lined roasting pan. Season with salt and pepper. Saute leeks until tender, about 4 minutes, in the butter in a large saute pan over medium heat. This part Mario said was key to Clinton’s recipe. He said any recipe that starts with sauteing leeks or onions is on its way to great success. Stir together the heavy cream, nutmeg, leeks, salt, pepper, and Mascarpone in a bowl. Clinton Kelly said if you can’t find Mascarpone, you can use cream cheese. Pour this cream mixture into all of the squash halves, filling about 3/4 of the way up. 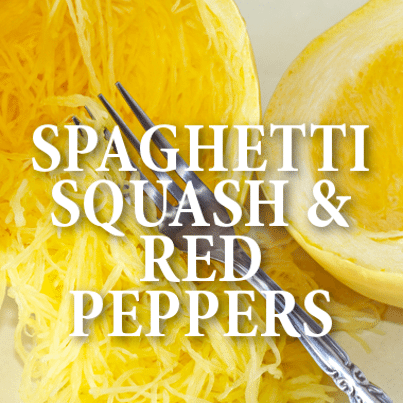 Top each squash with 1/4 cup of gruyere. Cover with foil. Bake for about 1 hour, until tender. Serve with grilled bread. To maximize your eating experience, scrape the sides of the squash, stirring these pieces into the creamy center. Then scoop some of this filling onto the grilled bread and enjoy the best thing Clinton Kelly ever created!